So irony seems to be the deal of the day. If we look back at how The Jetsons or 2001: A Space Odyssey depicted a not so distant future, we laugh with the current knowledge that we’re not flying around in hovercrafts. Yet many a truth is said in jest, and if we knitpick at these concepts we may find that many technological developments are an offshoot of something we once thought was impossible, crazy and somewhat impractical. Offshoots of retro sci-fi creations can be found in the world around us and were inspired by the first visions of sci-fi film writers and directors. 2001:A Space Odyssey featured voice command recognition in 1968 that only released onto the market in 2012. Touchscreens were featured in Star Trek decades before the release of the first touchscreen smartphone. Back to fashion, I love Jeremy Scott’s recent Spring Summer 14 range. His space invader repeat prints and assertive critical statement prints donned a type of Mars Attacks! tone. I believe the commentary behind the sarcasm is more than relevant. Collage artist Le Corbus brings similar concepts and critical narrative to the forefront with his retro futuristic propaganda prints. If we watch fashion and pop culture we may get an idea of what’s around the corner. Today’s ideas influence tomorrow’s creations. 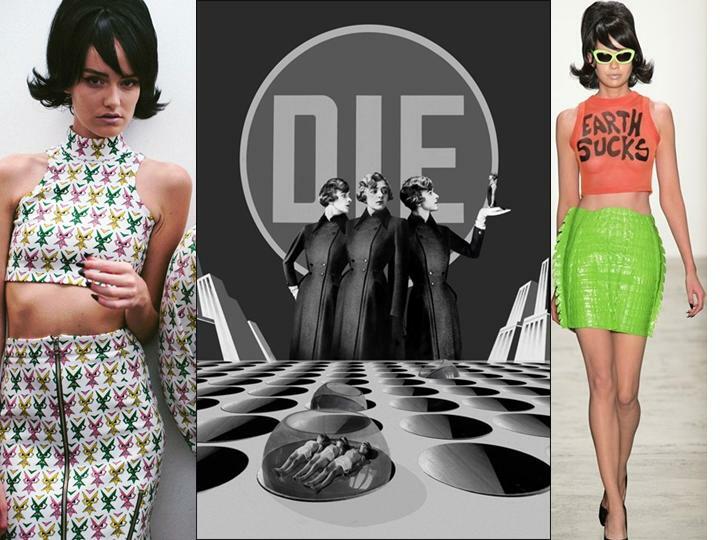 Images (left to right): Jeremy Scott’s space invader print outfits, Le Corbus art, Jeremy Scott SS14 collection. 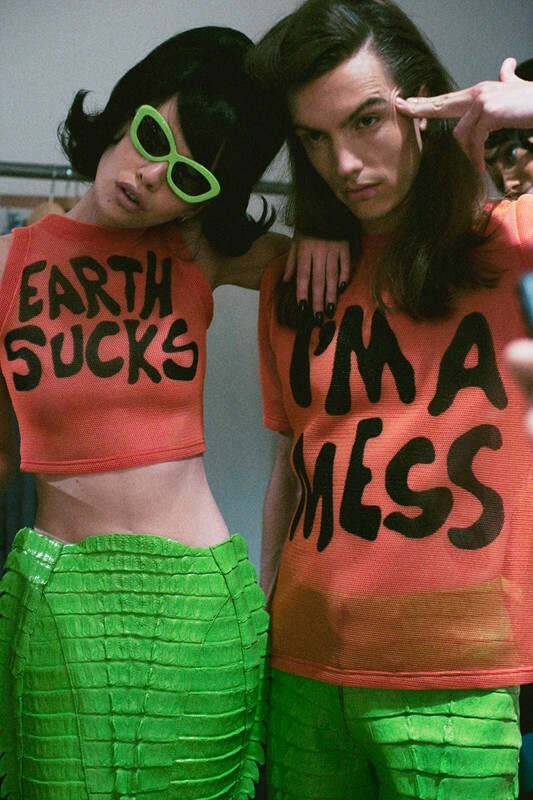 Below: Jeremy Scott behind the scenes. For more film influence on technology check out this link. With the promise of summer around the corner, beach days and bonfire voodoo nights, let sugar skulls be your inspiration. 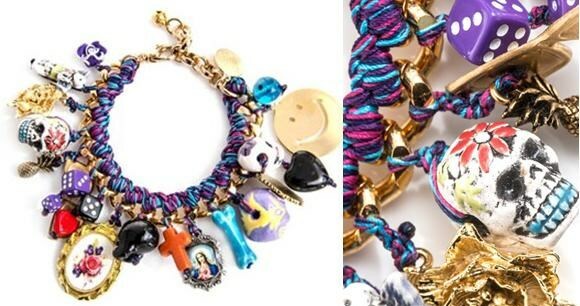 On the search for sugar skull designs I came across this Mongolian tropical charm bracelet by Venessa Arizaga. It’s a gorgeous cluster of little treasures ranging from religious memorabilia to sugar skulls and voodoo beads. It’s gold plated and therefore not cheap, but this should guarantee your friends don’t have it. A unique treasure. 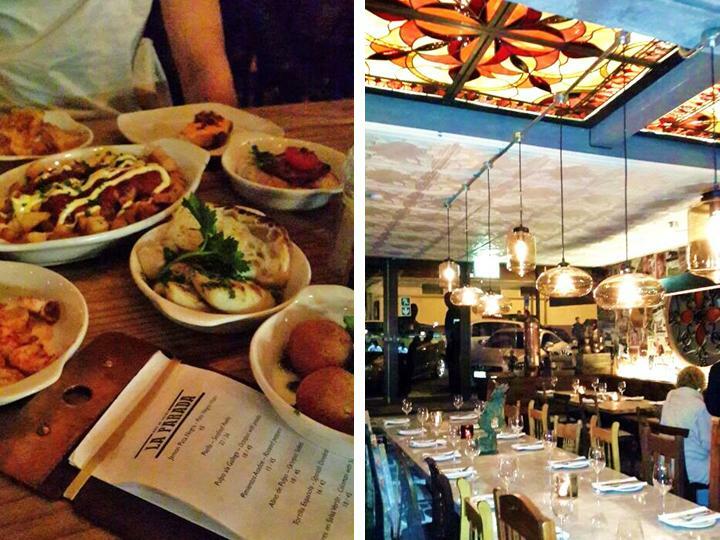 Capetonians can welcome yet another great addition to the trendy restaurant and bar list, La Parada. This new Spanish tapas heaven boasts a beautiful open plan interior, with a view stretching through the big glass windows from the outside and expanding inside to look over an open plan counter top to the kitchen on one side, and a bar on the other. 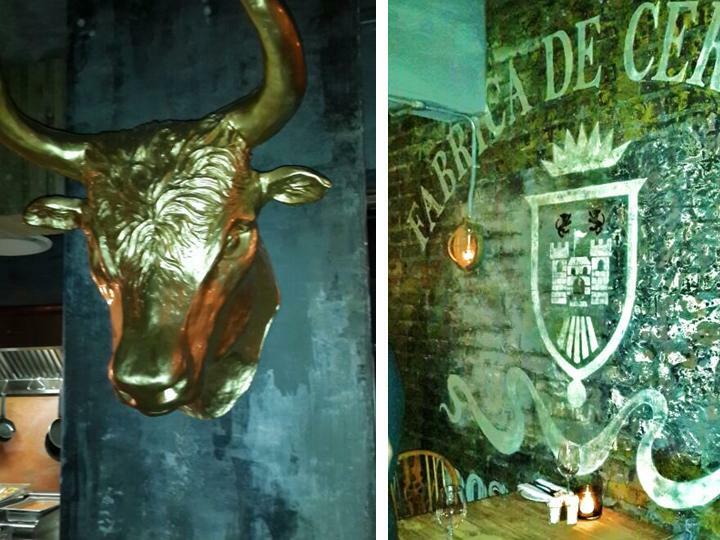 The decor comprises of a combo of wood, glass and metal, with details such as tarnished copper clipboard menus, wine barrels hanging from the roof, stained glass panels and a large gold bull’s head hanging on the wall. The restaurant is split into two, with sit down tables and leather booths in the restaurant and large wooden share tables in the bar half, perfect for bookings or a spontaneous pop in drink and snack. The stained glass roof feature and glass floor panel add special artisan touches to the restaurant whilst distressed walls and a Spanish movie poster wall collage add an old world edge. 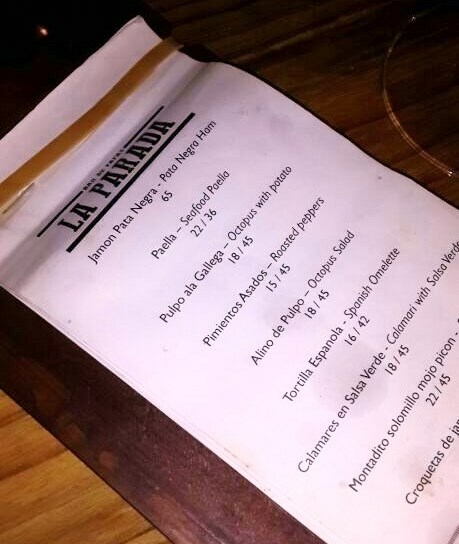 It’s no surprise that La Parada has a sister restaurant in Kalk Bay, as the decor suggests that these guys are experts at bringing old world Spanish appeal and contemporary twists together with an artisan feel. A club is planned to open below the restaurant to fully utilize this amazing space. The tapas were delicious. We ordered a bottle of Groote Post: The Old Man’s Blend red wine and sampled a selection of mouth watering bits. The tapas come in small and large portions and are reasonably priced ranging from R15-R45 depending what size and type of tapas you order. The mouth watering prawn croquettes and calamari with salsa verde were my favourites. My friend raved about the oxtail canneloni. We shared a portion of Patatas Bravas which also hit the spot and topped it off with tasty rice pudding. They have a great selection of wines, craft beers and cocktails to compliment the tapas menu. All in all a treat for the senses, La Parada offers a great combo of delicious tapas and drinks with updated old world Spanish charm. Address: 107 Bree Street, Cape Town. Open 12am until late, Monday to Sunday. Minimalism is the trend of our time. Sure, we’ve seen overly eclectic trends come and go, but I can boldly say they serve as a buffer, a buffer for the inevitable. The great thing about minimalism is that it never quite reaches it’s maximum point. It’s nearly like a gauge serving as a point of reference to other trends. It’s the streamlining of the eclectic. Pick out what’s necessary and lose the the rest. It can be seen creeping into the cut and controlled colour palate of many trends, influencing high quality fabrication technology, a controlled colour palate and cut. So what gives Minimalism the edge? It focuses on the primary elements that make fashion genius. The technology that comes with the trend introduces us to new fabrics that are laser cut, have enhanced texture or mould like a second skin. These fabrics influence cut and have a transcendental influence. They transport us into the future, or at least the future we wish to imagine. Chances are minimalism will improve on itself so that in another 20 years our current trends will look to us then like the 90s looks to us now. Many types of architecture, lifestyle choices and philosophies have gone minimal. And so has our clothing. For the meantime it may be a higher fashion look but with an educated guess I can say it’ll be what we’re walking around in in the decades to come. It has the foresight to introduce us to the silhouettes of the future. 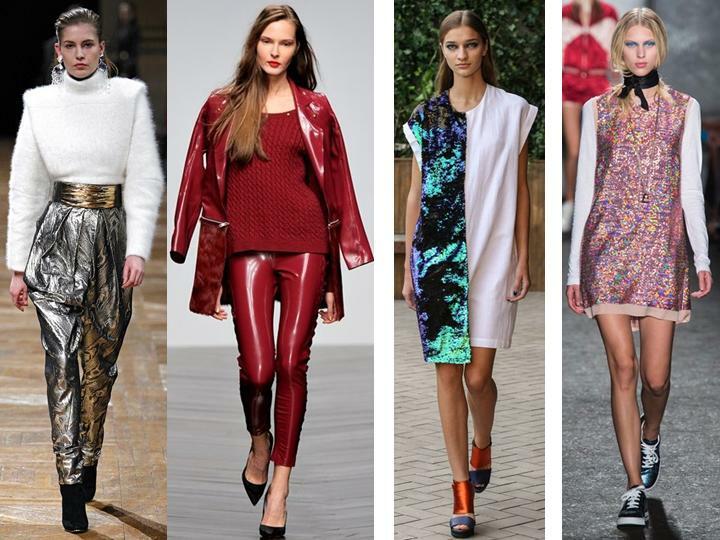 Images from left to right: Topshop Unique SS13, J JS Lee SS14, Lacoste SS14, J JS Lee SS14, Victoria Beckham SS14. Continuing on from the magic of Muizenberg market, I walked around and came across a stall that was more like a treasure chest. White Rabbit Days. 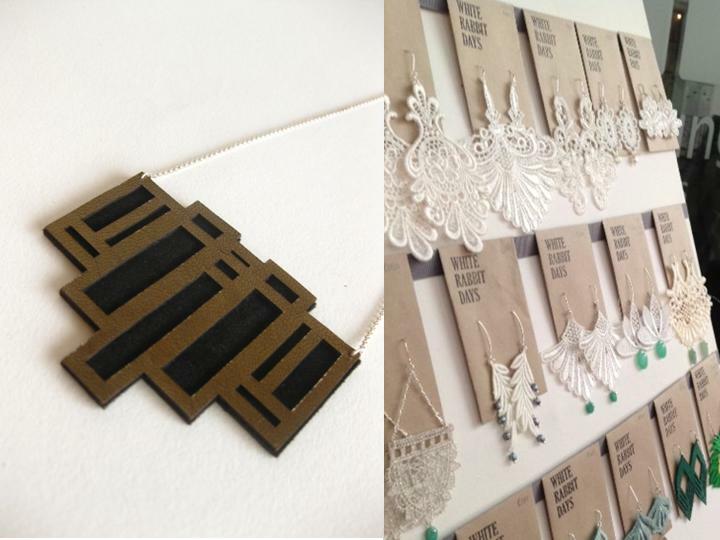 It’s a collection of beautiful laser cut leather accessories, as well as lace accessories and beautiful plaited ribbon neckpieces. 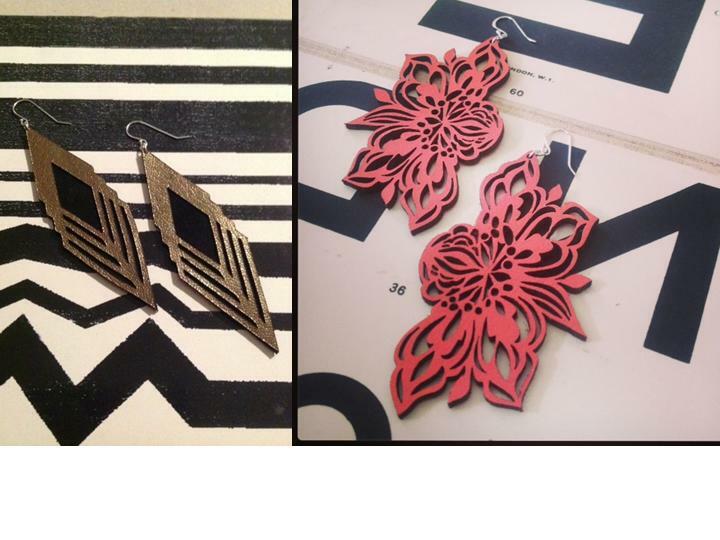 From art deco inspired shapes to beautiful intricate floral patterns and chandeliers, there’s something for everyone. 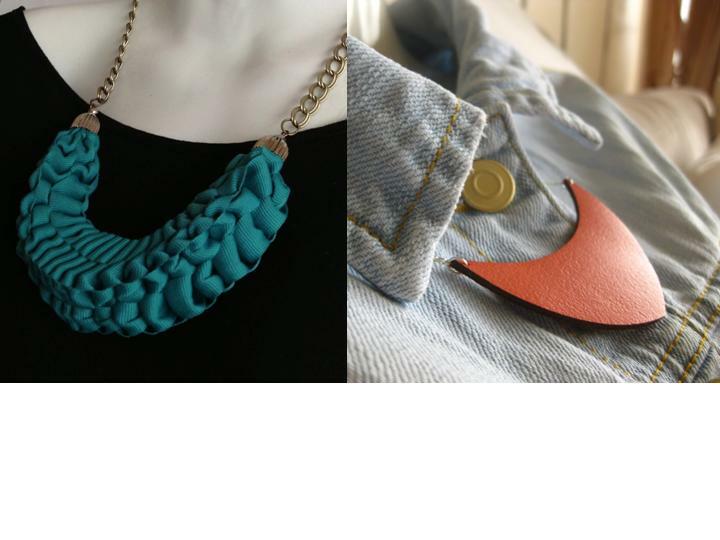 I was drawn to the beautiful punchy yet controlled colour palate from beautiful neon coral to shiny bronze and crisp white. So if your outfit needs an instant pick me up, a touch of crafted beauty or some bespoke glamour, just follow the white rabbit to a place where accessories shine. Follow White Rabbit Days on Facebook at this link or browse the designs in person at one of the following stockists: The Fringe Arts, Haas, Coco Li, Utique, Tintswalo Atlantic and The Wild Orchid Boutique. Muizenberg market is great. I’ve been there twice and both times I’ve felt like I was transported into a different dimension. The people are so friendly and it’s a chilled out break from the city with a free spirited feel that makes Cape Town one of the most versatile places. From trendy town you pop over to the other side of the mountain and you are still surrounded by mountain and sea, but with a more bohemian fishing village feel stretching from Muizenberg into Kalkbay and Simonstown. It’s rustic and every day feels like the weekend there. At the market Donny walked up to me with a glass of wine that tasted magical. We ended up finishing 2 bottles. 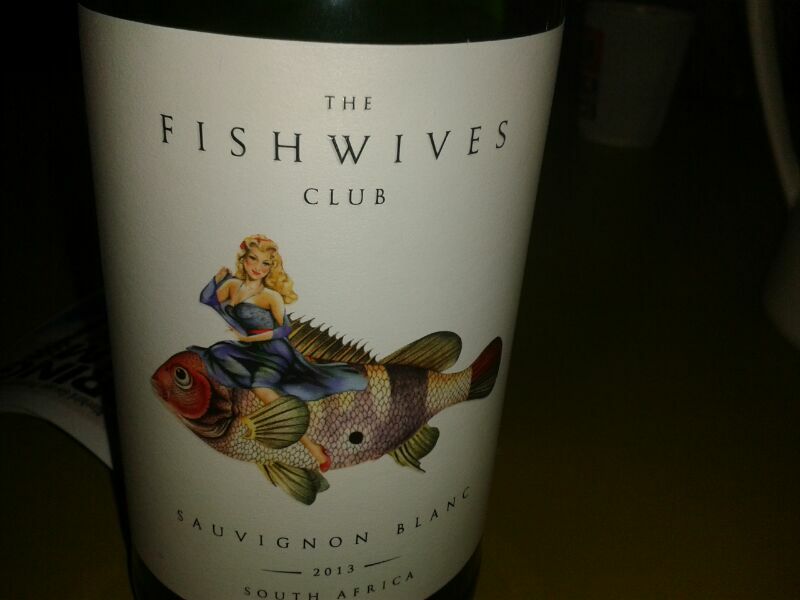 It was a sauvignon blanc called The Fishwives Club and is from The Fishwives Boutique Winery and Buitenverwachting Estate. The sauvignon blanc was beautiful, crisp and slightly fruity for a standard sauvignon blanc but in all the right ways. The talking point though was the unusual gorgeous packaging. The bottles feature different artworks of goddesses riding colourful fish. The artworks on the bottles were displayed on two different canvasses, the one being a sauvignon blanc and the other being a blanc de noir called Eros, cleverly an anagram for rose and the name of the Greek God of love. The fish artworks on the bottles were done by Mieke Wertschnig and the ladies were painted by Sam Brown. The Fishwives Club wines are the perfect wines to accompany seafood and a long relaxing afternoon at the coast. This is what magical market afternoons are made of. 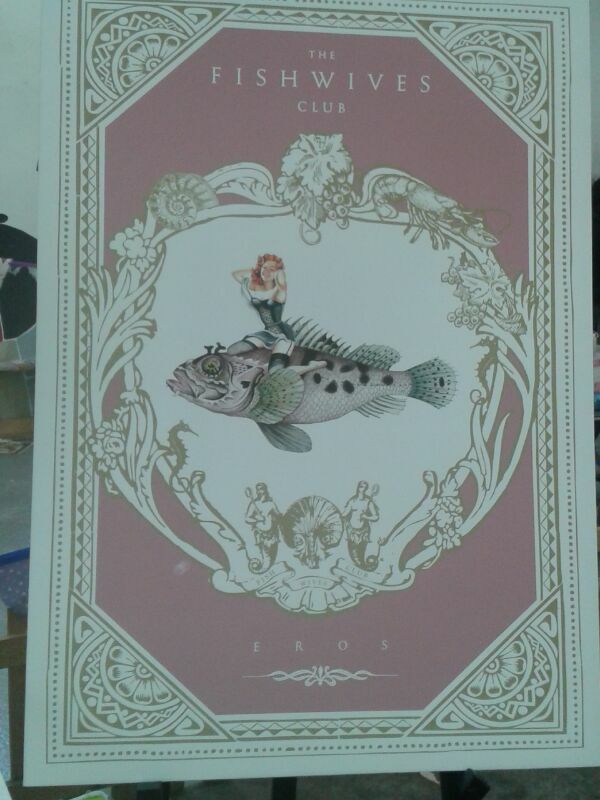 You can follow The Fishwives Club on Facebook at this link.